Looking good was our intent. To share with all our mates. And they played long and loud. It was a happy party crowd. I didn’t have a care! And a dramatic face plant ended my night. And all because of that stupid light! I’m swearing off the drink! Categories: Poetry, Rallies & Events, Travelling | Tags: campervans, CMCA, motorhomes, poetry, Pontville, rally | Permalink. When you arrive in Devonport on the Spirit of Tasmania it’s only a short drive to three of the most iconic tourist destinations, Anvers Chocolates, Ashgrove Cheese and the Christmas Hills Raspberry Farm. They offer you a trio of tastes – and even some free camping at Christmas Hills. There is also a chocolate museum you can explore that gives you the history of chocolate since the Aztecs, with moulds of old easter eggs and specialty chocolates. If you’re in luck you can see the chocolate being made. And I dare you to resist the wonderful display of chocolates to buy. Before you settle down to breakfast here, though, read on for the other tasty delights ahead! A little further down the Bass Highway you’ll find Ashgrove Cheese, another well known breakfast stop and a place to stock up on treats for Happy Hour. 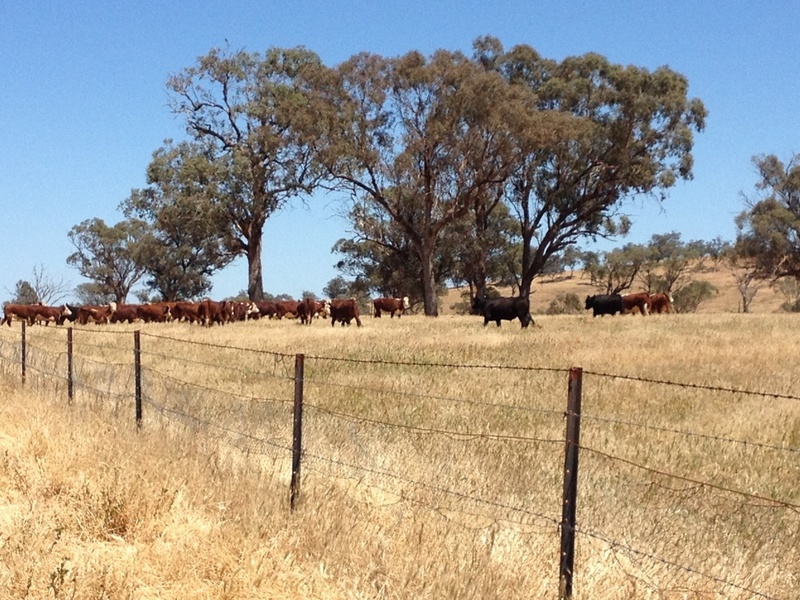 Colourful cows welcome you to the shop, but glance across the road for the real thing. The shop stocks all the varieties of cheeses made at Ashgrove plus a wonderful selection of other Tasmanian products such as sauces, jams, cider and relishes. It’s interesting to see the cheeses all stacked for aging. And yes, they are open for breakfast if you’re hungry by now. The Raspberry Farm at Christmas Hills is more than just a cafe. There’s a lovely lake you can walk around, pretty gardens to enjoy a coffee in, views of the huge greenhouses that grow the raspberries, and best of all you can stay overnight in their big rig carpark! It’s truly an indulgence to wake up in the morning and wander in for raspberry pancakes (for me) or more traditional breakfast food if that’s what takes your fancy. Now come for a walk with me around the grounds …. You don’t have to go very far when you arrive in Tasmania to enjoy the wonderful fresh food that Tassie is famous for. This is my Trio of Tastes, chocolate, cheese and raspberries, to tempt you to explore even more. Categories: Australia, photos, Tasmania, Travelling | Tags: Anvers Chocolates, Ashgrove Cheese, camping, Christmas Hills Raspberry Farm, motorhomes, Tasmania | Permalink. 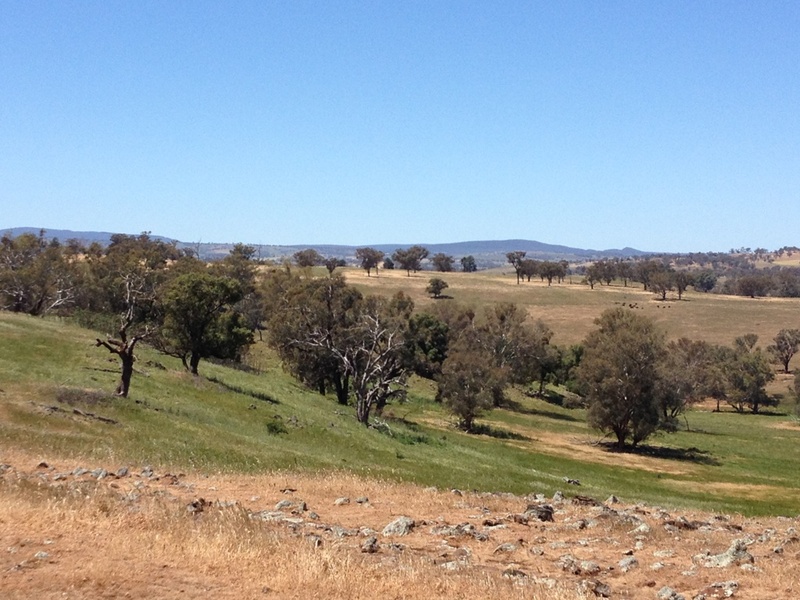 From a rally in Bingara to a wine festival in Orange – how good is this life. 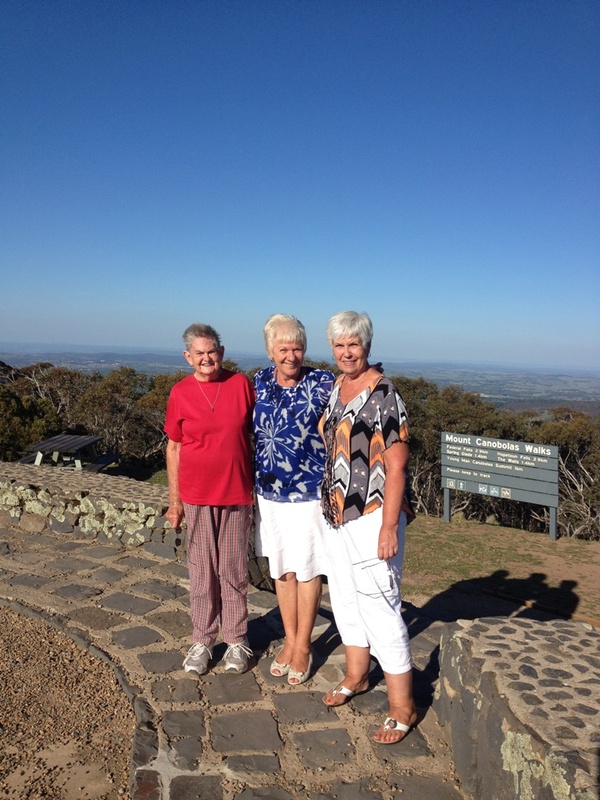 A trip of about 550 kms took me to my next destination, which was broken with a stay at Coolah Home Base. 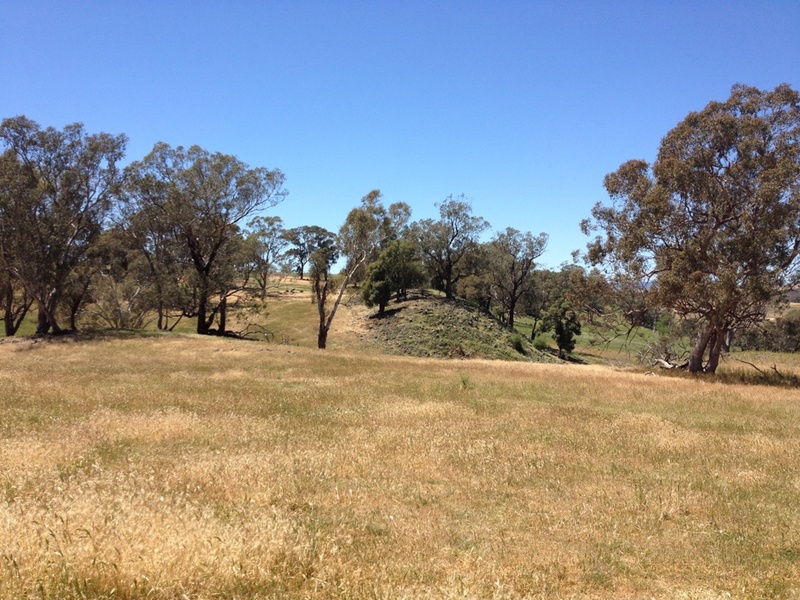 After the Bingara Rally, fellow Solo June and I went back for a quiet couple of days on the Gwydir River before heading south to meet my sister Marion at a farm at Cudal, about 50kms from Orange. We stopped for a couple of nights at Coolah Home Base, a great place owned by a couple of ex Solos, so they have a great camp kitchen and Happy Hour room. It was good to catch up with the washing, too. Some of the other Solos had also gone to Coolah before heading off to the Narrabri Rally – or in whatever direction they were going. The morning we were leaving I was chatting to Pauline who decided to join June and I and spend some time in Orange too. So our 3 vans set off! 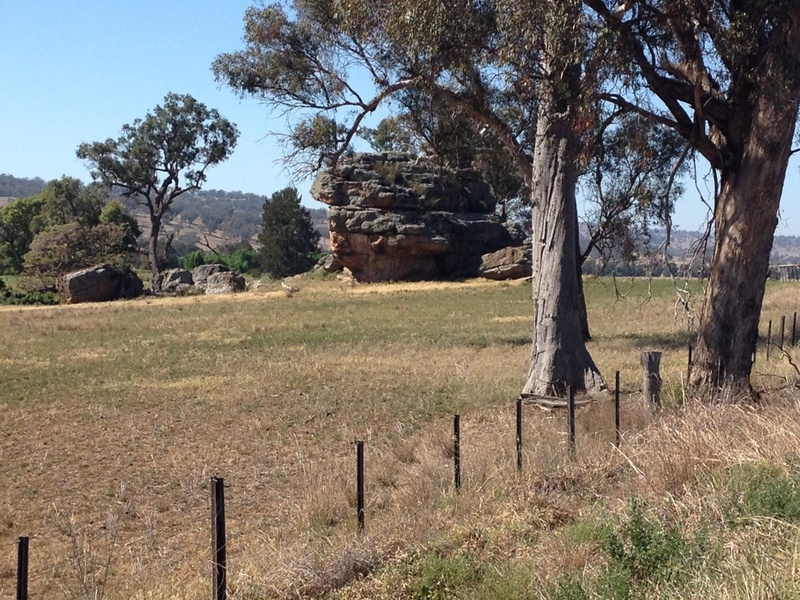 We travelled through some pretty country but I couldn’t resist stopping to take a photo of The Rock which we passed not long after leaving Coolah. I was looking forward to seeing my sister Marion. The last time we were together was December 2012 and she had planned this trip for some time. She had bought a tent and was going to join me camping at her friend’s farm. Anyhow, my blogs got the better of her and 3 days before leaving Tasmania she bought herself a campervan and left the tent at home! This was going to be a lot more fun! Marion’s friend Brian welcomed us to the farm at Cudal and it soon resembled a camping ground with Marion, Pauline, June and I setting up camp. We had arrived on the Saturday, spent the day settling in, and on the Sunday Brian did the tourist thing and took us to our first event for the Orange Wine Festival – a fabulous choral afternoon at one of the wineries. 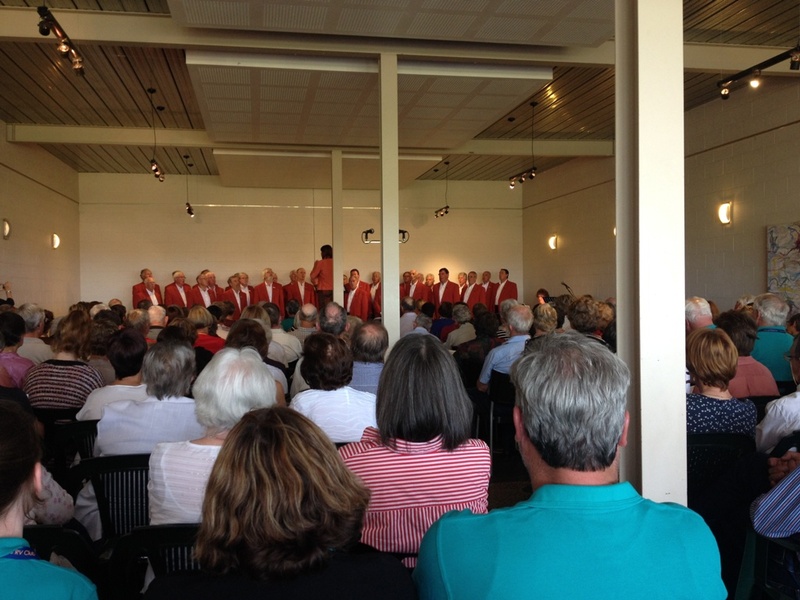 The Orange Male Choir performed with a female group called Canta, who also provided the most amazing afternoon tea of home cooked goodies – a perfect afternoon of good music, food and friends. 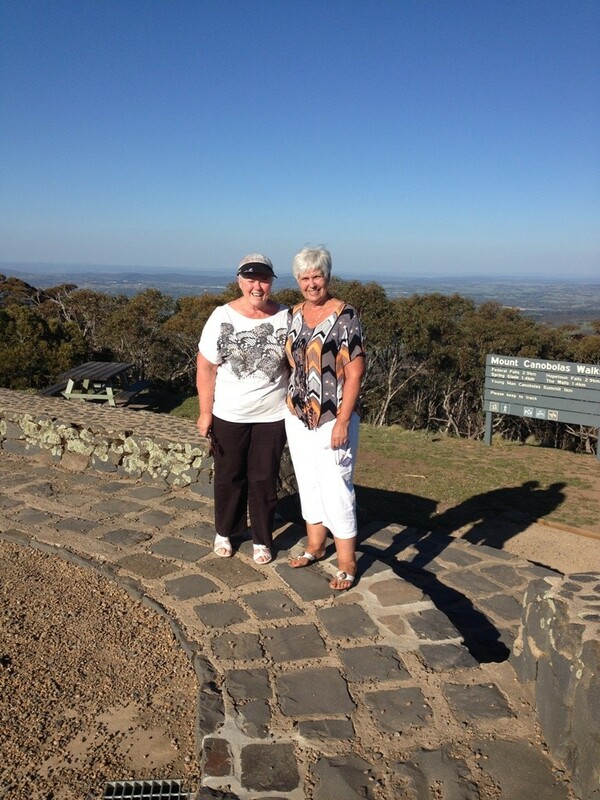 After the concert Brian took us for a drive to Mt Conobolas. 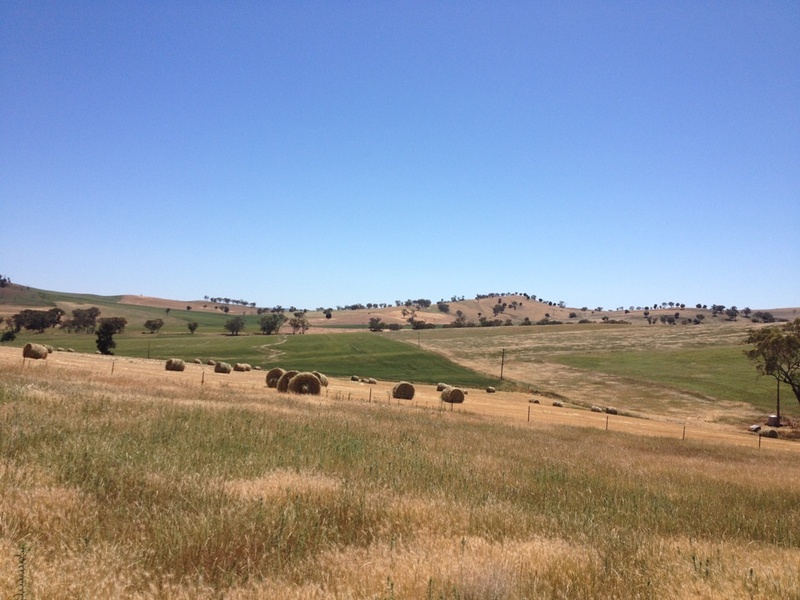 Another day he took us for a drive over the farm – beautiful countryside. Apart from Marion and I going to a few local wineries for tastings the other major event we went to was the Night Markets in Orange on Friday night. There were 40 s talls of lovely wine and food and the markets were held in a central park with beautiful old trees. 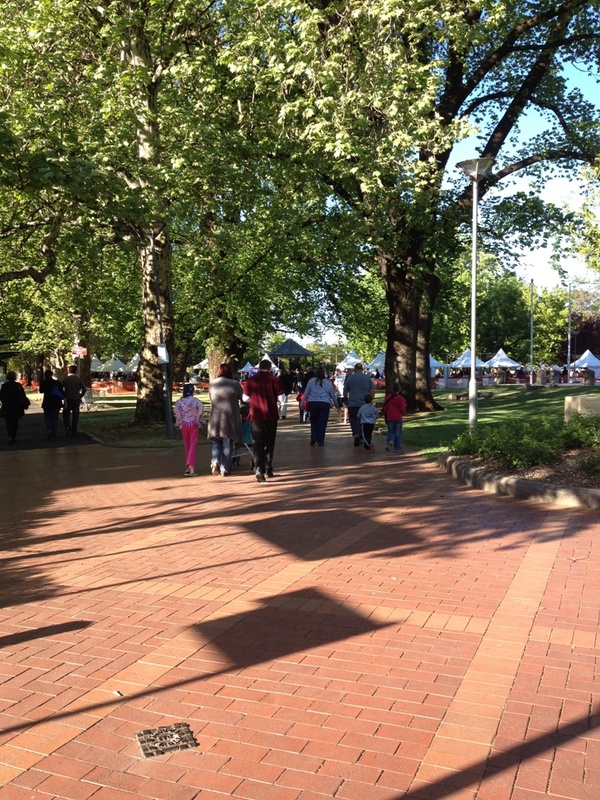 The atmosphere was great – lots of families and everyone there to enjoy themselves, just like we were. We sampled some local food and wines before heading back to the farm at Cudal, where our stay was coming to an end. 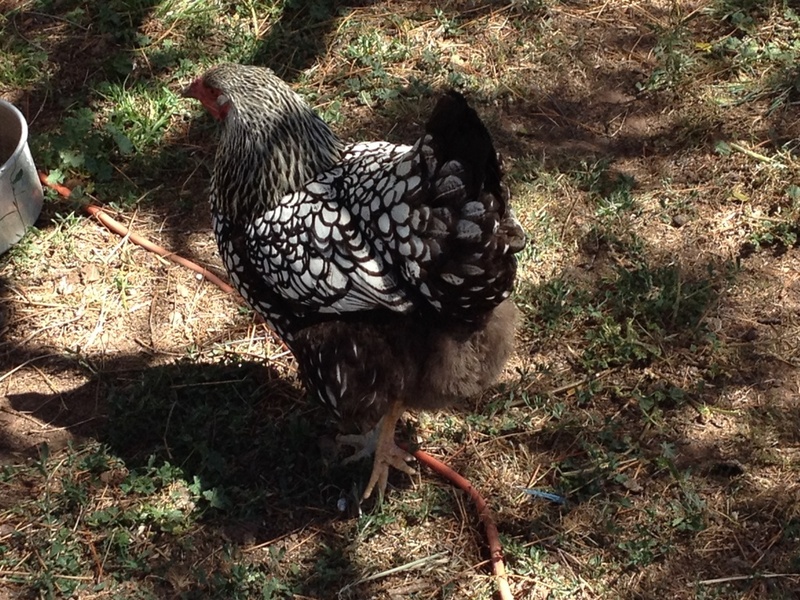 I have to show you this photo of an amazing rooster that we saw the day we went to an Iris farm near Molong. Monday morning we said our farewells and headed south…… but more about that later. 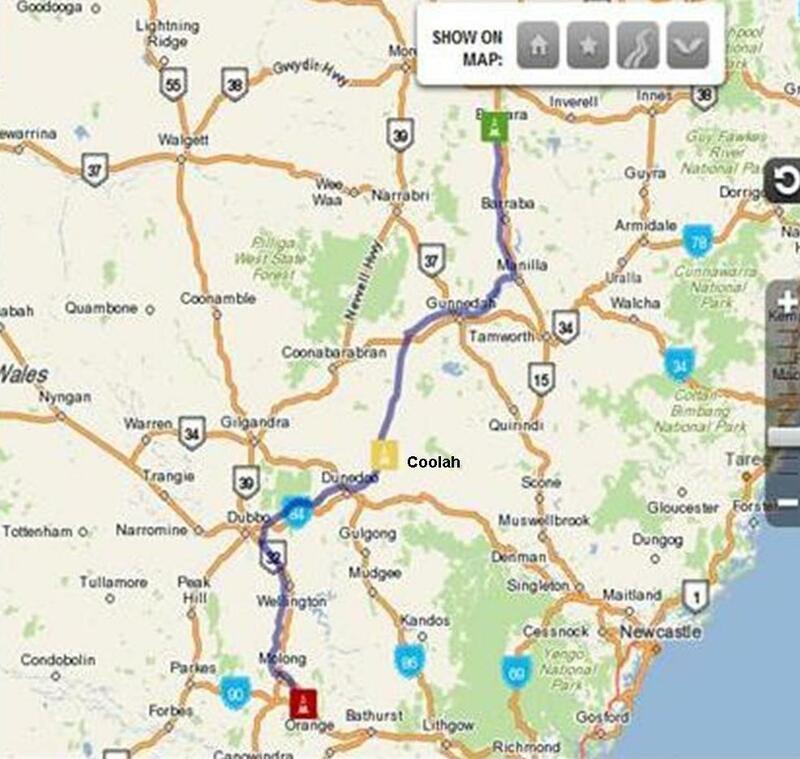 Categories: Camping, Travelling | Tags: campervanning, campervans, camping, Central New South Wales, Coolah Home Base, Cudal, free camping, motorhomes, Orange, Orange Wine Festival, Solos, travelling | Permalink.